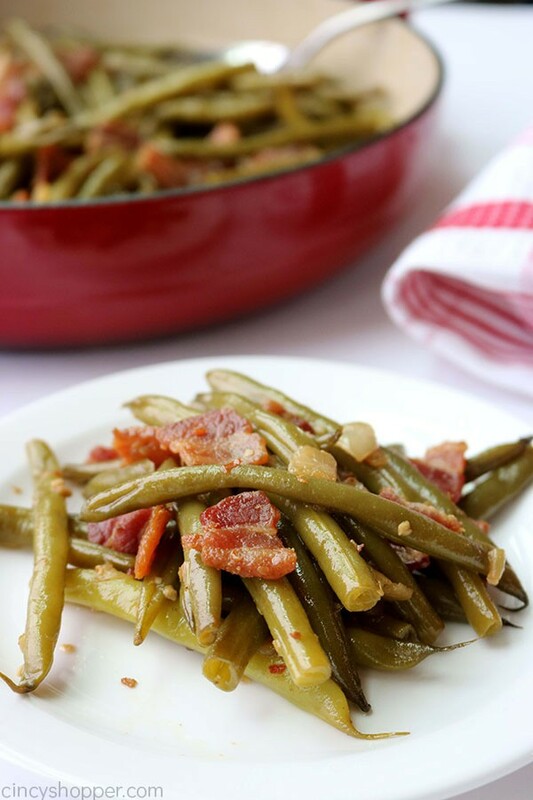 You will find fresh green beans, thick cut bacon, onion, and amazing flavor in these Southern Green Beans. We cook them slowly for the perfect tenderness. 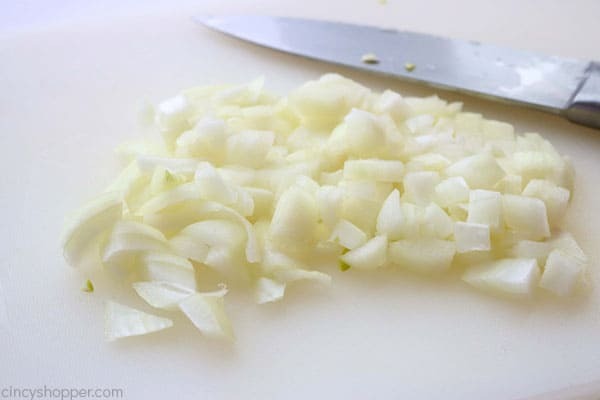 Add them as a side dish to just about any meal, they are absolutely delicious! We are a green bean eating family. We make them multiple times per week. I am usually pressed for time so it is usually just plain canned or frozen that I have to serve this big family of mine. 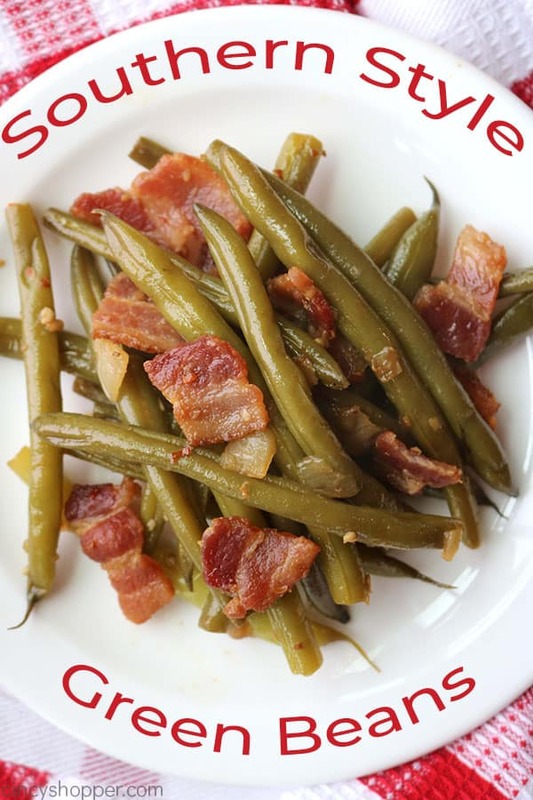 Since I had some time to prepare our dinner over the weekend, we decided to make some of our favorite southern style green beans for our Sunday dinner side dish. It’s been way too long since we made them last. 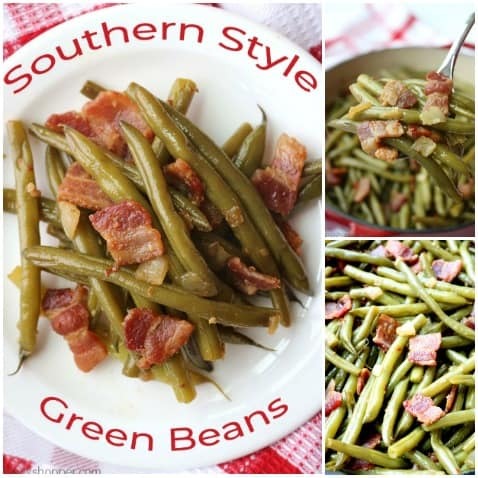 If you have yet to try southern green beans, you have really been missing out. I can understand why some of you have yet to try them. Many fear bacon grease. The dish is visually unappealing. The beans are never bright green and they do not have any crunch to them. 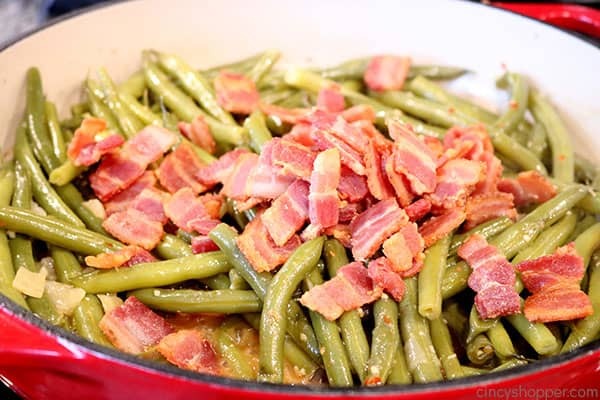 But if you make these green beans loaded with bacon, you will suddenly be over the visual discomfort. I promise you will be wanting to load your plate with a second helping. They are so good. 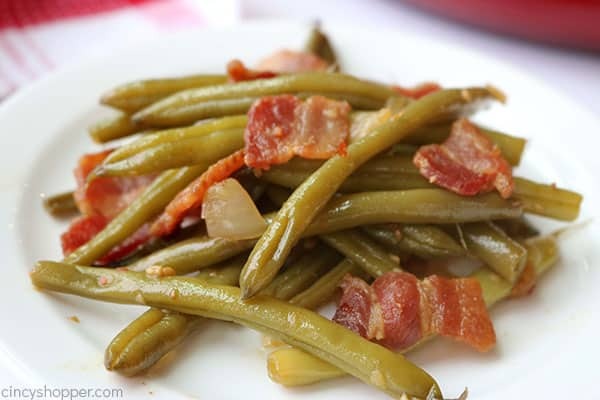 There are a few variations of southern style green beans most all of them include bacon. Some recipes like Paula Deens include new potatoes and others do not. Others will use canned green beans to keep it easy. Some add in additional spice, others keep the dish as simple as it is meant to be. My recipe keeps it quite basic with just a handful of ingredients. When we make our Southern Green Beans, we make them just like traditional southerners. I start with thick cut bacon. I even splurge for the really good bacon. I use 7 thick slices. You will notice many recipes around the internet that will only use 4 slices. I know right from the start that these recipes can not be as tasty as mine happens to be. The extra bacon is really needed. I am sure those recipes taste wonderful but they can not have as much flavor as my dish. The bacon is one of the key ingredients in my opinion. Other recipes will have you leave your bacon in your pan through the entire cooking process. I never do this. I remove until the very end to add it back in. The reason being is that the bacon will become soggy. Plus, there is plenty of bacon flavor infused from the bacon drippings. I use fresh trimmed green beans for our recipe. It takes a bit of time to rinse and trim the stems but the results from fresh are so good. 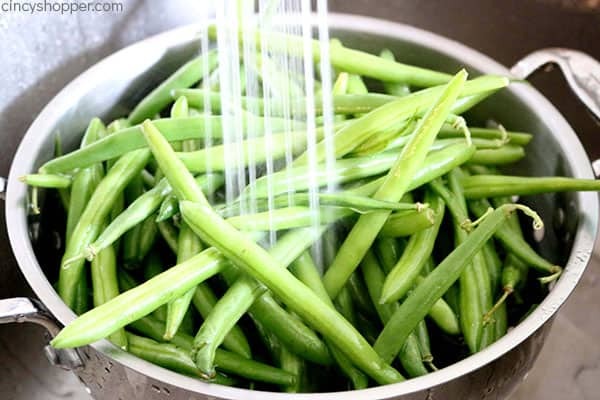 You can use frozen green beans or even make them quicker with canned green beans but the results will not be the same. 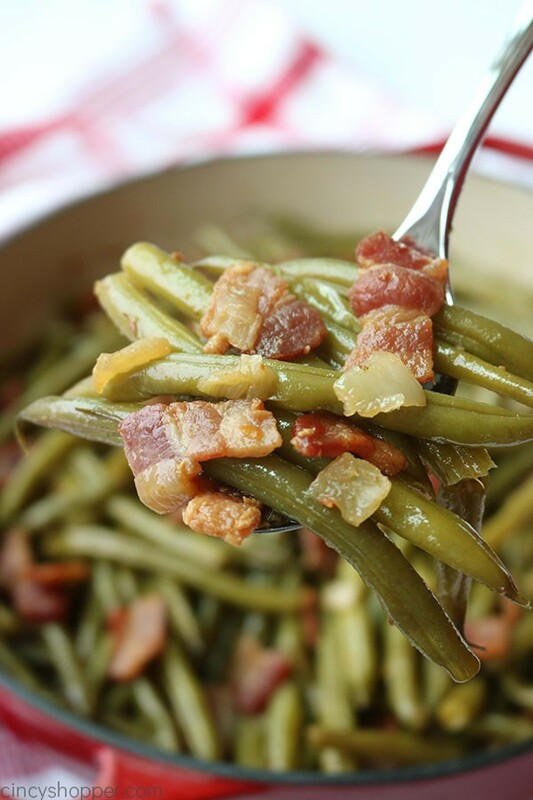 We slow cook our fresh green beans with a bacon broth that is loaded with onion and garlic flavor. I do add in a little bit of red pepper for just a bit of added spice. 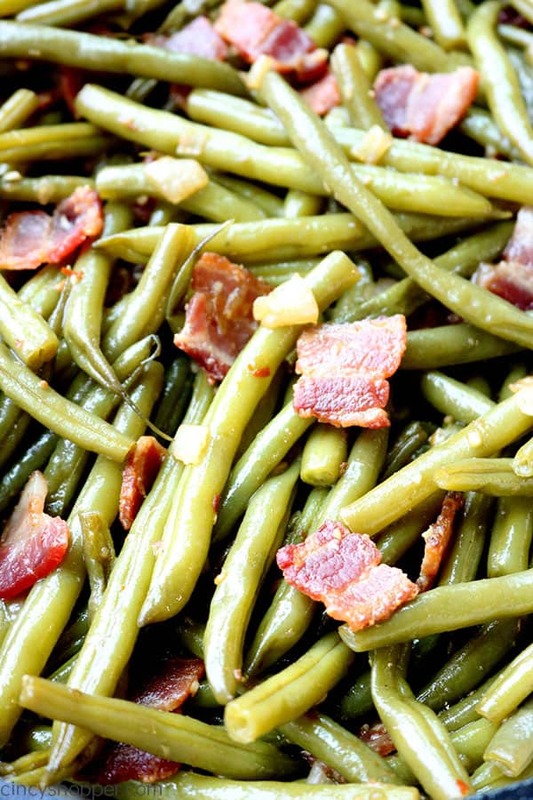 The slow cooking process really makes these Southern Green Beans melt in your mouth good. 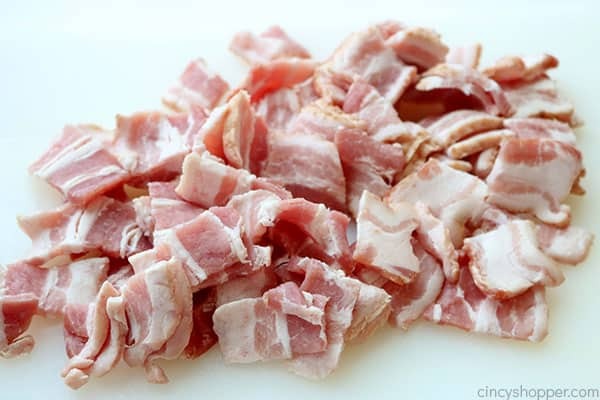 Cut bacon into 1″ pieces. Cook in a large skillet over medium heat until lightly browned. 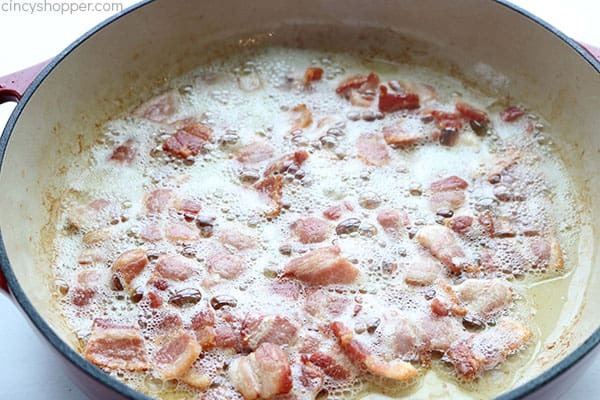 Remove bacon pieces from pan and set aside. 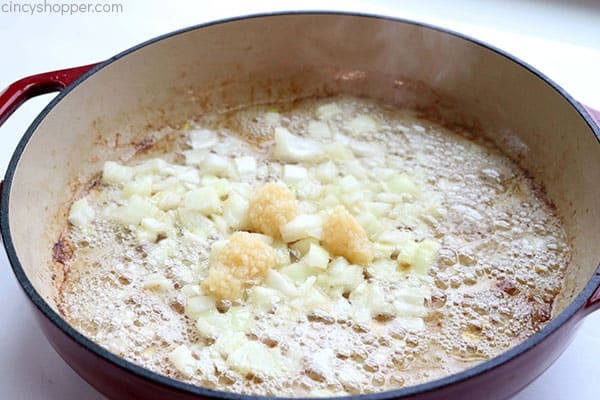 Add onion and garlic to pan. Stir to coat in grease. Rinse beans and trim off stem ends. Cover and simmer over low heat for 1 hour, until beans are tender. Uncover, add bacon and continue to simmer for 15 minutes. I have been tempted to make this recipe in the Crockpot or my Instant Pot. I have yet to do so. I worry that the results will be way different. Maybe it would work great, I am not sure. Sometimes messing with a traditional old school recipe can be difficult. I fear not duplicating the exact results that make the dish extraordinary. If you attempt either of those versions, be sure to leave me a comment with your results. Cut bacon into 1" pieces. 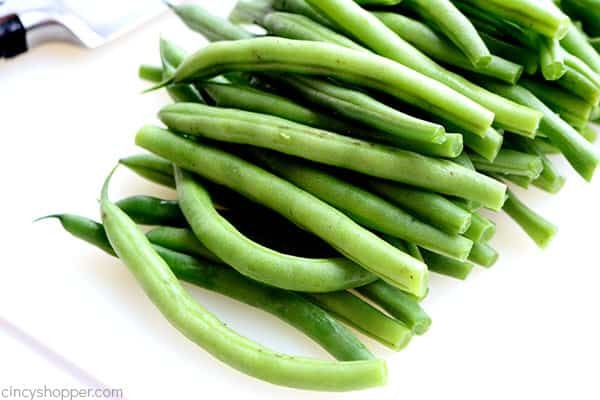 How much green beans do you use with this recipe, it is not stated. Hi Jeanne! I am so very sorry about that being missing. I think it might be an important ingredient:) I have updated the recipe to reflect the 2 pounds of green beans needed for this recipe. How much green beans did you use? They are missing from the ingredientS list. Hi Mihaela! Thanks for the heads up. I have update the recipe to reflect the 2 lbs of green beans I use in this recipe. 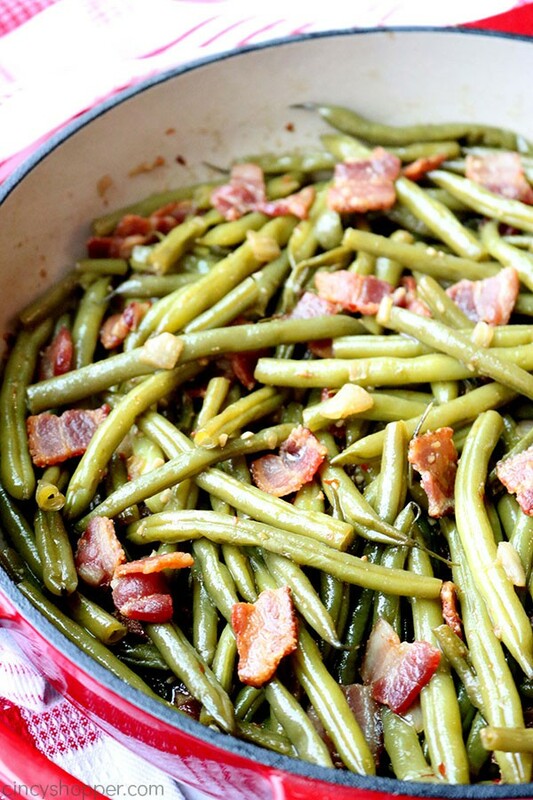 How many green beans do you use in this recipe? Hi Suzette! So sorry about that. I have updated the recipe card. I am not sure how it got left out. Thanks for letting me know. 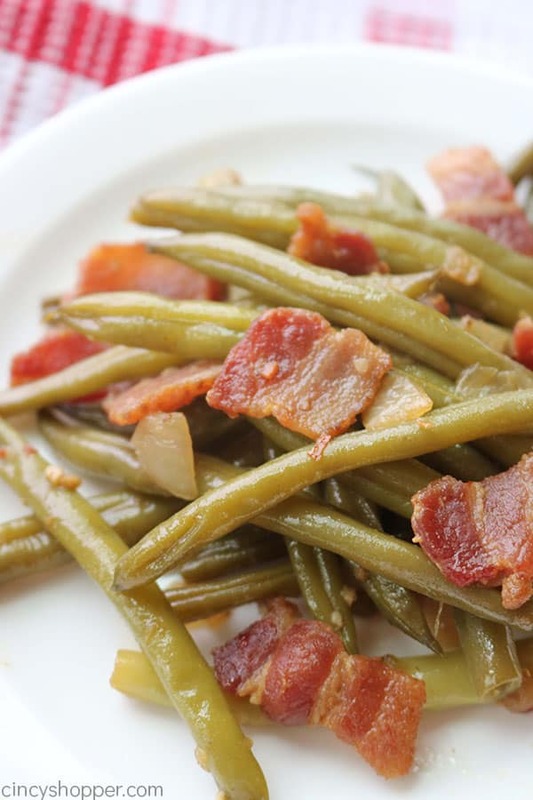 How much green beans do you use for this recipe? Hi Dani! So sorry about that. I have updated the recipe card. I use 2 lbs fresh green beans with this recipe.